MOON TOWNSHIP — The Robert Morris Colonials (11-9, 6-1 NEC) defeated the Sacred Heart Pioneers (8-12, 4-3 NEC) Thursday night 72-64 at the Student Recreation Center at the North Athletic Complex. The game featured the two teams on top of the Northeast Conference (NEC), but the Colonials stayed alone in first place following the game. The Colonials entered the game in first place in the NEC and Sacred Heart entered the game tied for second place. The Colonials also had won six of their last seven NEC games, and returned home after a four-game road trip. “Every game in this league right now is going to be closely contested. I just think that there’s no one team that is superior to the others,” said Colonials’ head coach Andy Toole about the schedule thus far in the NEC. Matty McConnell converted 3-of-5 shots from behind-the-arc tonight and 6-of-8 total from the field, while also adding three assists and six rebounds. “I saw a couple (three-pointers) go in early and that really opened up the driving for me. Knocking those down early was a confidence booster,” said senior guard Matty McConnell. McConnell had his season high in points (19) and Jon Williams had his career high in assists (10). A quick layup by Charles Bain, and a three-pointer by McConnell, gave the Colonials an early 5-0 lead. After giving up two easy layups to Sacred Heart, the Colonials got five more with a three-pointer by McConnell and an easy layup from Yannis Mendy. They were up 10-4 with 17:18 left in the first half. After a few baskets by the Colonials, including a three-pointer by Bain and Jon Williams, the Colonials had a 16-4 lead at the first media timeout with 14:55 remaining in the first half. The Colonials were played great defense early against the Pioneers as RMU limited Sacred Heart to 3-of-13 from the field in the first eight minutes of the game. But, a converted shot and-one by the Pioneers’ Zach Radz and Koreem Ozier gave the Pioneers some life again and cut the Colonials’ lead to eight. McConnell and Radz both exchanged three-pointers to make the score 24-16 before Josh Williams drew a foul with 7:50 left. 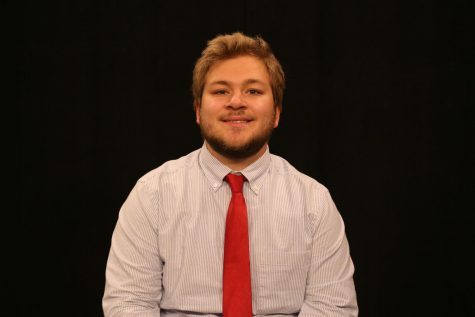 “Matty (McConnell) is a competitor and is a guy that really wants to win and is a guy that is really knowledgeable,” said Toole about McConnell’s experience in NEC play and how that helps the team moving forward. After letting the Pioneers cut the lead to just three points, Mendy made a layup and McConnell converted a layup and-one to give the Colonials a 35-27 with 1:30 left in the first half. After having a fourteen point lead in the game, the Colonials slowed down at the end of the half and took a 35-29 lead into halftime. Radz and McConnell led their teams with 12 points each. The Colonials still were shooting over 45% from both the field and from behind-the-arc, but their seven turnovers allowed the Pioneers to keep the game close. Jon Williams then opened the scoring for the half with an easy layup ten seconds in. After a few converted shots, including a three-pointer by Josh Williams, and two free throws, the Colonials had a 45-35 lead with 16:06 left in the game. After the media timeout, Malik Petteway made a layup and Chris Coalman converted a layup and-one to give the Colonials a 52-36 lead with 14:12 left. A 5-0 run by the Pioneers cut the lead to 11 before the under-twelve minute media timeout. Scoring was pretty stagnant until Charles Bain hit his second three-pointer of the game to make the score 55-43. A layup by the Pioneers cut the lead of the Colonials to 10 before the media timeout with 7:04 left in the game. A converted layup and-one from McConnell gave the Colonials a 63-53 lead with 1:54 left in the game, but the Pioneers went right down the court after. The Pioneers committed a flagrant one foul on Bain and he sank both free throws to make it 65-55. 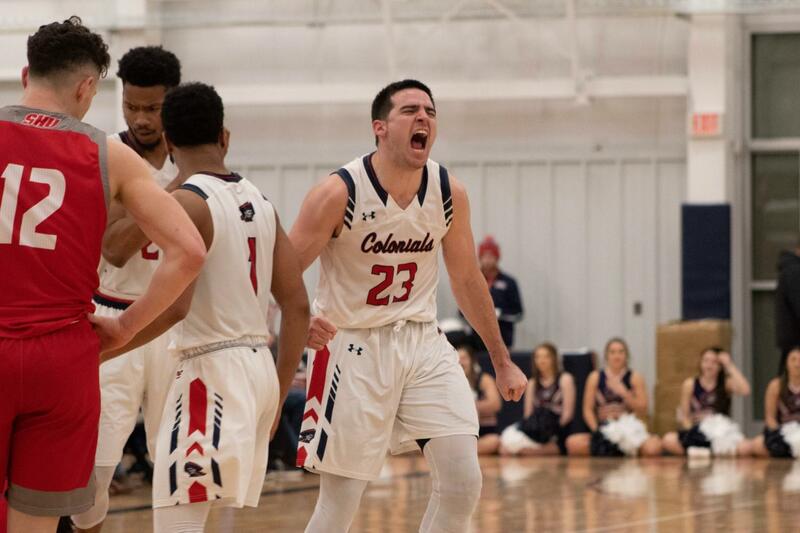 Mendy made both free throws of the one-and-one that gave the Colonials a 67-55 game that essentially put the game out of reach for Sacred Heart. Three Colonials scored in double-digits and McConnell led the Colonials with 19 points. Bain was not far behind with 17 points. Radz led the Pioneers with 17 points. The Colonials will continue their home stand and play at the Student Recreation Center at the North Athletic Complex on Saturday against the Wagner Seahawks (9-9, 4-3 NEC). The Pioneers will travel to Loretto, Pennsylvania to take on St. Francis (PA) (7-11, 3-4 NEC).